The only delightful thing about Cleopatra is her name. 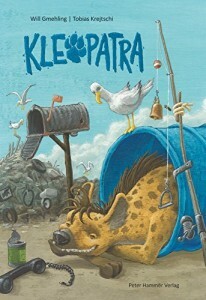 She is a laughing hyaena with everything that comes with a hyaena: a pungent smell, shrill laughter, spotted shaggy fur. Cleopatra runs a little shop at the end of the world, right next to the garbage dump. This is where she finds everything she needs in life: bones with little bits attached for breakfast and wonderful things for her shop. Real dust from Paris, bells without clappers, insoles. But she waits in vain for customers. Until Ed turns up out of nowhere, who doesn’t just buy the goggles without the lenses, but also enjoys keeping Cleopatra company. But even though Ed makes her life bright and sociable, Cleopatra more than ever dreams of a wild country that she has never seen. Of hot winds and glowing sunsets. Unable to resist the alluring visions, Cleopatra says goodbye and sets off on her journey.